This page explains some of Mark Howe’s activity, although it is truly only a fraction of it. Some of his purchasers believe they were scammed, and are freely distributing his computer to inform people. See what Mark’s customers have to say about Mark Howe. Mark Makes his false claims mostly under fake names like the one below. You’ll noticed in this one below he even claims the Ritz players used his computer. 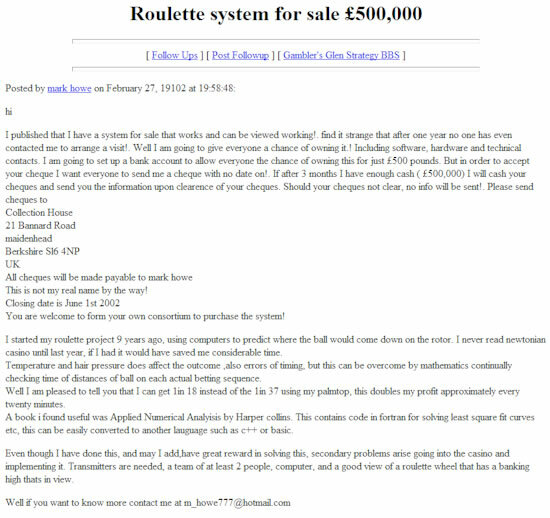 Mark claims the Guardian Newspaper witnessed a demonstration of his roulette computer beating a level roulette wheel at his “mansion” in Sheffield. The reporter confirmed the wheel was tilted. Beating a tilted wheel is very easy to beat even without a computer. 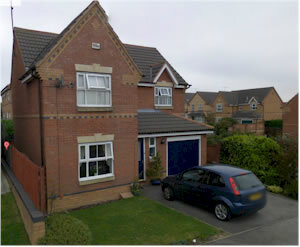 The Sheffield house shown below is where they met (photo provided by Google maps). It is the same address Mark himself publishes on his website. We have not revealed any private addresses. Mark impersonated government staff by sending me false emails and letters demanding I remove information about him. After I received a letter appearing to be from the the UK Gambling Commission, I contacted them to verify it was indeed from them. They could not confirm it was from them. Mark calls himself “Professor Mark Anthony Howe”. He also previously gave himself an ESQ title of nobility. Mark doesn’t appear to have the required qualifications for such titles. By his own admission to the above-mentioned professional gambler who visited him, Mark was a builder’s labourer. Mark shows a video of him counting of cash he claims to have won in one night. 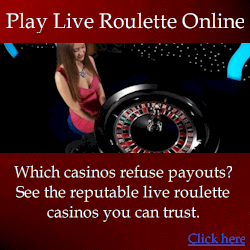 This conflicts with his claims that he only sells his roulette computer devices because every casino has banned him. Also as explained on this page, casino staff who have access to casino databases have confirmed he is not on any ban lists at all. I recently purchased a CNC Milling Machine from Mark Anthony Howe. I was sold an item not as described and of inferior quality. When I contacted the seller I received unpleasant replies using scare tactics and Mark threatened to contact the police!Mark also created fake Ebay ID’s and posted on a cnc forum regarding my purchase! A site moderator then confirmed these accounts were from the same IP address and linked his email address to www.roulettecomputers.co.uk and Marks other online scams.I have also reported Mark Howe to trading standards and have considered contacting the police, although I fear my wellbeing and the wellbeing of my family may be at stake if I escalate this matter to a police investigation. i. 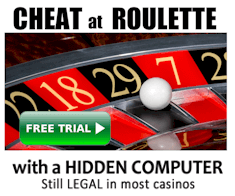 False Product Endorsement from Government Laboratory: Mark falsely claimed the National Weights and Measures Lab (UK Government Lab) tested and endorsed his roulette computer. When he published this claim, the lab clearly stated the claim was false, and reported the matter to the UK Office of Fair Trading. Mark then deleted the post with his claim, although a screenshot is below. ii. 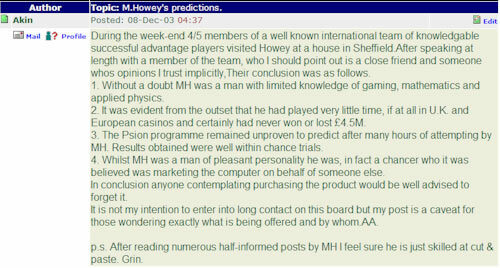 Fake positive reviews of his products: A roulette researcher named Ion Salui appeared to have posted on Mark’s forum claiming Mark’s roulette computer is effective as he claims. Previously, the real Ion claimed Mark’s computer is a scam. The “fake” Ion’s post is shown below. The real Ion read the post, and clearly stated he never posted it. To explain this, Mark claims the post was merely made from someone with the same name of “Ion Saliu”. However, in the original post, you can see Mark’s IP address “80.229.165.34” at the top, and the false IP address of “146.44.34.221” he posted in the actual message itself. Mark did not appear to realize the real IP of the poster was being published. Also see the real Ion Salui’s comments about this below. There are too many others to mention, although download a few of the fake reviews from his own private forum. 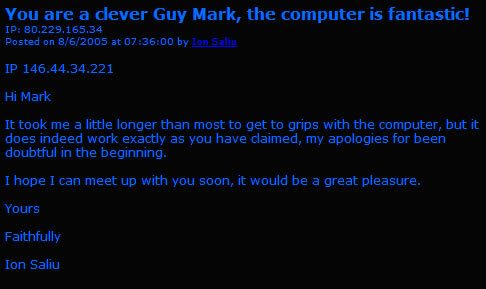 When confronted, Mark first claimed the deceptive posts were probably posted by his competitors to discredit him, although only he was able to post at the forum because of the forum’s settings. See the below post of his making this claim. Mark eventually also contradicted himself again by claiming he didn’t know the post wasn’t really from Ion. This is despite the post indicating Ion had tested Mark’s computer, and the real Ion making it very clear he in fact had never even seen Mark’s computer, as Mark would no doubt have known. 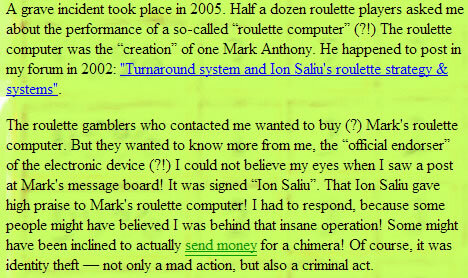 Mark has impersonated famous people: Mark impersonated a famous roulette computer developer named Thomas Bass. He pretended to be Thomas asking Mark to participate in a movie about a roulette computer team. Thomas clearly stated that he did not make the post. You can contact Thomas Bass yourself to confirm. Mark eventually claimed that he employed staff who published and false reviews and impersonated others against his will. Mark is very well known to post under many fake names and has been banned from many forums for doing this. Some of his fake names appear to be Strip Crusher, Mr X, Franki, King Dom, Biomorphic, Neutral Observer, Money to Burn, Ricky, Mathewg, The Wiz Kid, Alison Gianquitto, Cristov, vladimir, Aleks1, milestone, rodneybrown, paxobird, and House Edge. Even once he attempted to impersonate another member (“Docker”) by replacing “O” with “0” (zero) in the chat ID. The real Docker considered Mark to be a fraud and published negative information about him. Mark claims to sell his computers because he has won over £4,000,000 and has been banned from casinos. However, casino staff members, who access casino databases, have stated he is not on any known ban lists. 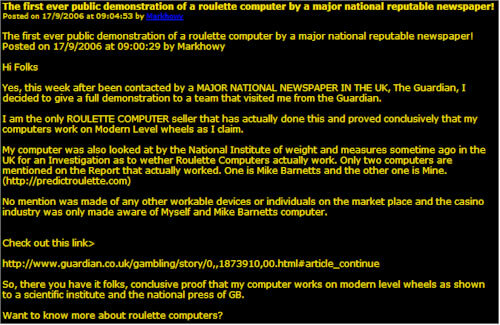 Probably Mark’s biggest claim is that he was visited by the Guardian newspaper who apparently witnessed a successful demonstration of his roulette computer on a level wheel. But from the article, the demo was clearly conducted on a “tilted wheel”, because the reporter says that Mark claims his computer will “also” beat level wheels. Nobody doubts Mark’s computer beats a “titled” wheel where the ball constantly hits the same diamond (metal deflector), then falls with predictable bounce. A computer is not needed to beat such wheels. But no demo was done on a level wheel, and it was not conducted at a “mansion” as Mark claims. Mark recently resided at a house in Sheffield, UK. He published this address himself on his earlier website, and claimed he lived at a “mansion”. An upset purchaser of his explained that the property is clearly not a “mansion”, as Mark claims, which can be seen on Google maps. Mark responded “He fails to mention that this property is worth £250,000 approximately and was purchased outright with cash or the Silver Ferrari on the drive in the picture.” But the land title from www.landregisteronline.gov.uk indicates the house was purchased for £110,000 by his ex-girlfriend (name withheld to protect her privacy), and the purchase was funded by a loan from “Norton Financial Services”, not cash as Mark claims. In light of Mark’s notorious dishonesty, I find it difficult to believe it is a Silver Ferrari in the Google satellite photo. Mark has made threats of violence against myself and other individuals who address his deception. There are active police cases against Mark from numerous individuals. If you wish to report him for similar behaviour, contact me and I’ll give you the case file numbers. 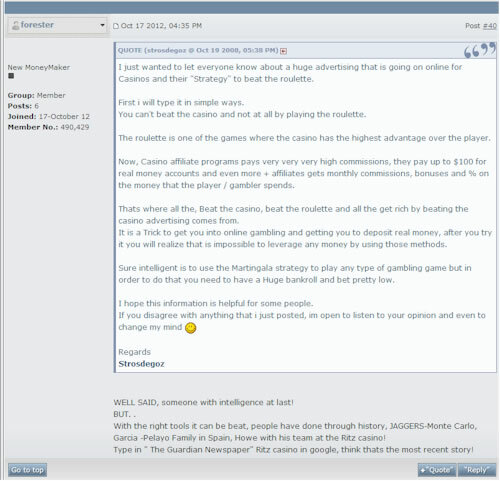 On the MoneyMakerGroup forum, Mark pretended to be “Forester” who is his competitor who also develops roulette computers. In the below sample, he responds to another member’s post. Mark’s comment is the bottom part. Note how he said “Howe with his team at the Ritz casino”. The issue is Mark had nothing to do with the roulette players who won millions in the Ritz casino. 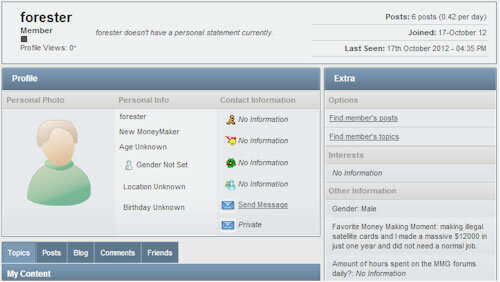 This forum member’s profile (Forester) is below, where you can see how he claims to make illegal satellite cards. Mark Howe is the only person who ever claimed the real Forester did this because he wanted people to believe Forester’s computers don’t work, and had to break the law making illegal satellite tv cards to make a living. And when you consider this forum member’s (fake “forester”) other posts are all aimed at discrediting his competition and promoting Mark, it is a reasonable assumption that it is again Mark posting under fake names and pretending to be other people. He has been doing this for over a decade, and has been banned from every major gambling forum for it. My intentions for publishing this information are not malicious. Initially I purchased Mark’s computer myself and found it was a scam. But I did not make a big issue of it. Other than briefly stating it did not perform as advertised, I did not mention his product. Numerous others made the same claims before me. But when Mr Howe discovered I sold competing roulette computers, he began publishing blatantly false information about me. I ignored him for about 6 months before warning him I would publish defensive material to address his manipulation, including information here that supports my belief he is a compulsive liar. Unfortunately this information, although verifiable and accurate, has made me the victim of his harassment and threats of violence which are now a police matter. If you believe you are a victim of Mark’s deception, report him to the authorities as many of us have. At this stage we have been told more complaints are needed before it is made a federal case involving criminal charges. Yes and I got tired of exposing his endless list of new lies. If anyone reads just a sample and they still proceed to buy from him, they should expect to never recover their money. Give the truth about this man, I’m not sure how anyone can make a conscious risk. It’s like betting on every number on the roulette table where you know you’ll get something, but the end result is you still lose.